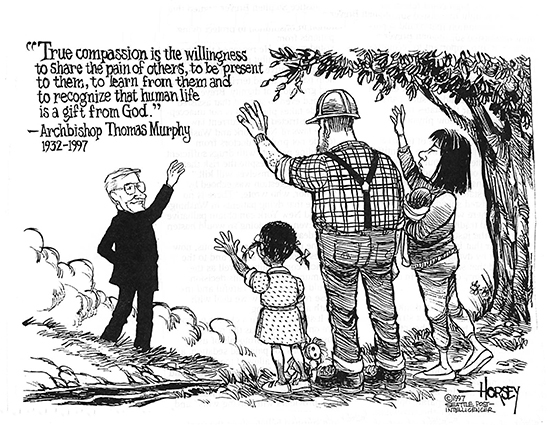 A cartoon drawing in the June 29, 1997 edition of the Seattle Times shows a group of members of Archbishop Murphy’s flock waving goodbye to him. Archbishop Thomas J. Murphy died in Providence Seattle Medical Center on June 26, 1997. Click here to view a video of the announcement of the death of Archbishop Murphy by the Very Reverend George L. Thomas, Vicar General of the Archdiocese of Seattle. Click here to view a video of Jim Compton, a Seattle-based television journalist, offering his view of the life and ministry of Archbishop Murphy.